The Bristol-based Mohamed Elshorbagy began his title defence with a hard fought and at times, tricky victory over Hong Kong’s Yip Tsz Fung at the Khalifa Sports Complex. The world number one and three time champion is joined in the last 16 by fellow seeds Paul Coll, Diego Elias and Simon Rosner. The first seed through for the day was Paul Coll, who weathered past a first game loss to overcome Mexican number one Cezar Salazar in four games. 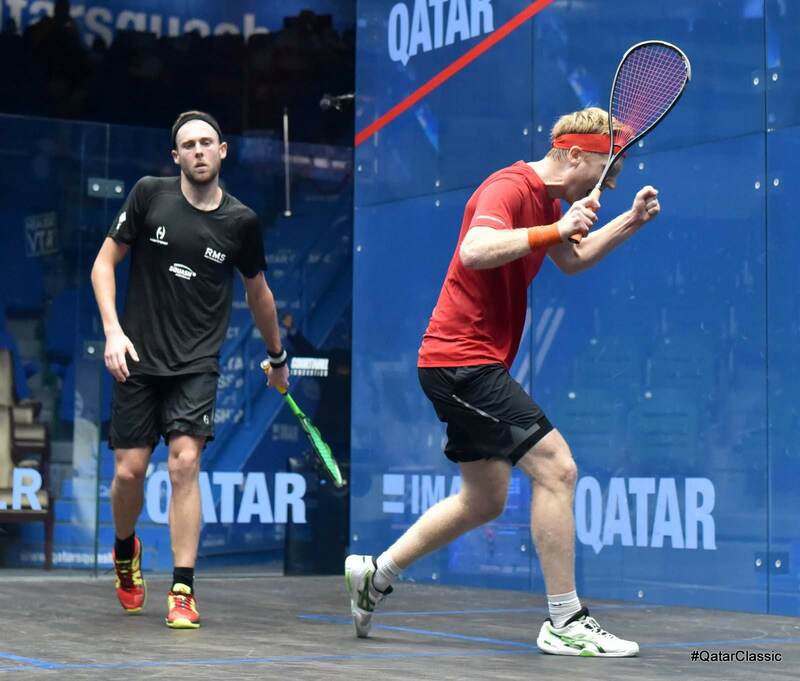 The Kiwi did not have a good start and gave away three strokes in the first four rallies of the match. Cesar was controlling the pace and went ahead to 8-4. But Paul tightened up and went on a 6 point spree to reach game ball, but simply couldn’t convert. He lost 4 points in a row to lose 10-12 and go a game down. The world number 8 played much better in the next two games, upping the pace substantially to a pace more comfortable for him. Although the Mexican did continue to play pretty well and even managed a few right guesses at the front, it was Paul that won the big points that gave him the next two games. It was apparent in the third game that the Mexican was tiring out and in the fourth, it was a stroll for the Kiwi. “I was a little passive at the start and Cesar was playing really well. It took me some time to find my range on court but I managed to catch up in the first game. It was frustrating I let the game ball slip away. I knew what I had to do – I started to lob the ball in the front more after he guessed quite a few correctly and eventually, I think he got a little tired,” said Paul Coll after going through. 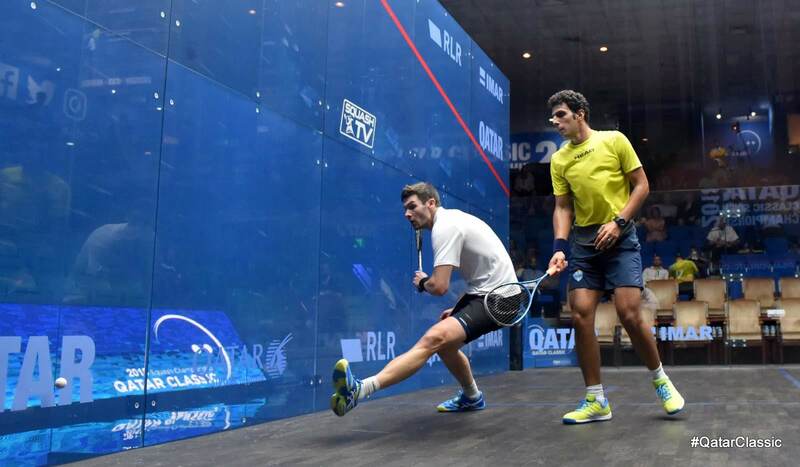 In the earlier match, Spain’s Borja Golan had kicked off the second day with a 3-1 win over Scotland’s Greg Lobban. El Toro, as he is widely known, controlled the backhand side with his trademark ruler-straight lines, and that was what made the difference today. 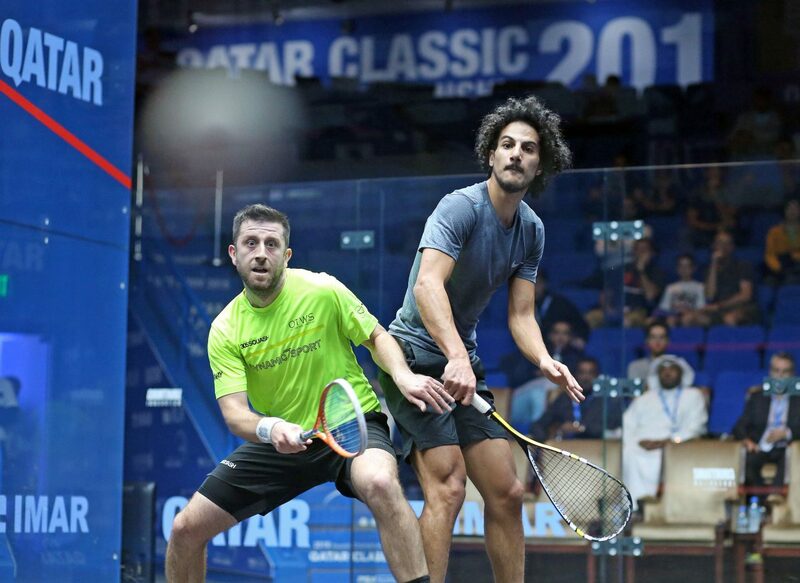 The squash falcon Mezan Hesham gave a superb display of what he is capable of today when he came back from a disastrous opening game to outclass England’s Daryl Selby in an entertaining match. The 24 year old from Cairo, who has been plagued with injuries for a while now, was simply a class above Daryl, who often found himself on the backfoot of many rallies. After losing the first game 3-11 in just 5 minutes, Mazen fought back with a hard earned second game 11-9 that lasted 15 minutes. With the match at one a piece, Mazen went into overdrive in the next two games, dropping just a combined 5 points to move into the last 16. “I had to change my game a bit after the first game. I had to stay solid in the back first before I go into the front. I was trying to get him as deep as I can before I go for my shots. There’s a lot of things in my mind right now, I’m not 100% fit yet, so it’s always up and down. Some days I have it good, and some days, it’s just bad. I’m just trying to play as many matches as I can without hurting my body,” said the world number 35 after his win. Peruvian Diego Elias also made it through today, in a similar fashion of Paul Coll. Having had game ball in the first game at 10-9, Diego lost out 11-13. But the lanky former world junior champion came back strongly to take the next three games with relative ease, eventually winning 11-13, 11-4, 11-3, 11-5. “I was going to the front too early in the beginning, so I just tried to hit the ball with more pace and with a better length. I feel good right now and I think I played well today, and I hope I can do better than last year,” said Diego, who made it to the last eight last year. Perhaps the most shocking result of the day was the humiliation of Omar Mosaad at the hands of Englishman Adrian Waller. The lefty from Enfield, England was in fiery form as he bagel-ed the former world number 3 in the first game in just 4 minutes. 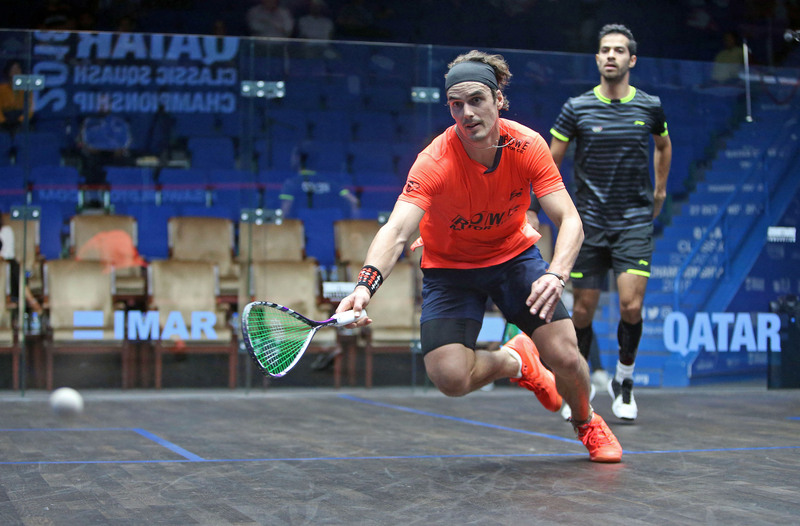 In the second, he raced to a 7-0 lead before Omar eventually won a point. Omar fared better from hereon, but Adrian wasn’t letting this get away. “It all happened so quickly. I just started really well and kept focussed. I don’t necessarily think of the points at that time. I just felt really good playing the way I wanted to and I kept trying to replicate that in each rally. And I did. It was a great start and carried that on really. Two 3-0 wins, I can’t say I’m not pleased. I just got to look forward to the next match and be well prepared really,” said Adrian, the world number 37. Mohamed Elshorbagy, arguably the most popular player here amongst the local juniors, played to a packed gallery in his opening game of his title defence. He started off very well, not allowing Yip Tsz Fung to get his rhythm, often pushing the Hong Kong player to the back corners. This being their first ever match against each other, Yip wasn’t prepared for the barrage of attacks and pace the beast of Alexandria was throwing at him, and fell behind 3-11 after 6 minutes. The second game was a different game altogether as Yip managed to move Shorbagy a lot more now, hitting some delicate winners he is known for along the way. 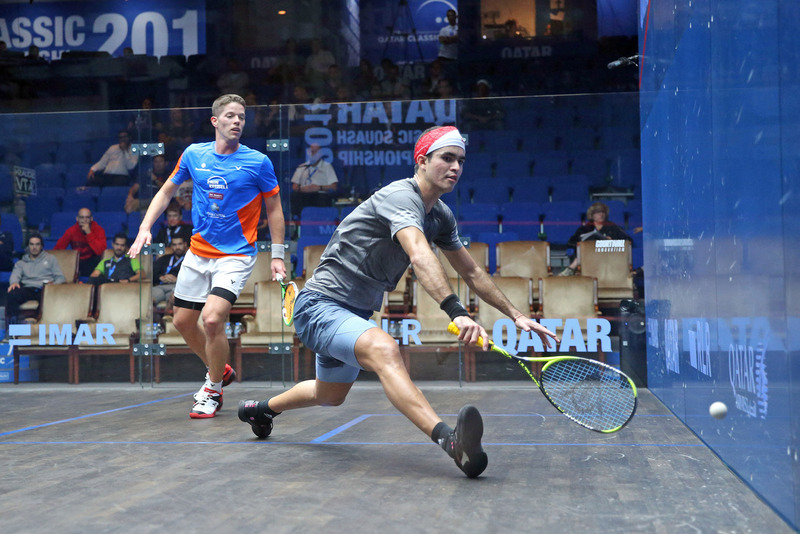 A much closer affair, but it was 11-9 to the Egyptian. In the next game, Yip, runner-up at the World University Games this year, held on to a mid-game lead to close the game 11-6 on a stroke to pull a game back. 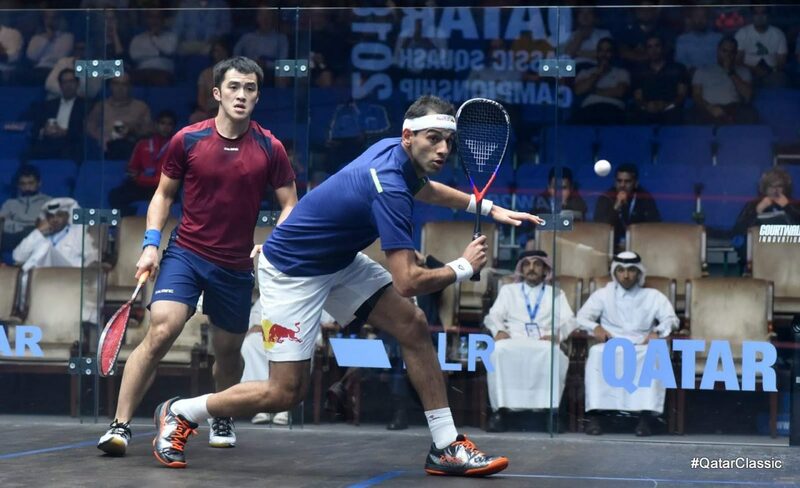 The fourth game was a close affair with Shorbagy gaining advantage and reaching match ball at 10-8. Yip saved one, but that was all he managed. “I think he didn’t know what to expect in the first game (because we were playing for the first time), so he was kind of watching me play and in the second he played much better. So it was the opposite – I was like watching him play more. In the third, he played even better. Former world number 12, Tom Richards then took to court and scored an upset win over Australia’s Ryan Cuskelly, ranked 14 places above him. “It means a lot to me (to win today). I tried to back up a good week last week where I had a good tournament. I played well there and to back that up here to show that I am worthy of beating these guys again. I’ve had a couple of years with injury, so it’s taken me about a year and a half to get back here,” Tom said after. Men’s Qatar Classic, Second Round, Khalifa Spots Complex, Doha, Qatar.